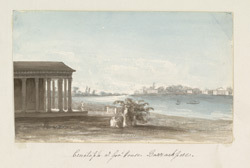 Watercolour of the Memorial Hall at Barakpur near Calcutta in West Bengal, by Marianne Jane James (b. 1805), c. 1828. Inscribed on the mount: 'Cenotaph at Govt. House Barrackpore'. Lord Minto's Memorial Hall, also known as 'The Temple of Fame', was erected in 1813 as a memorial to those who had fallen in the Mauritius and Java Campaigns of 1810-11. Barakpur was originally a permanent barracks, but when Marquess Wellesley took over the Commander-in-Chief's residence, in 1801, he decided to make improvements to the area. Wellesley commenced the building of a summer residence for future Governor-Generals' and also landscaped the gardens in the 'English Style', adding an aviary, a menagerie and a theatre. As a result, Barrackpore Park became a popular place for leisure pursuits.